Preheat oven to 350°F. Line cupcake pan with paper liners. In a medium bowl, whisk together the milk and egg whites. In the bowl of a stand mixer fitted with the paddle attachment, or with a hand mixer, beat the butter, sugar and vanilla bean seeds at medium speed for 3 minutes, or until the butter and sugar are very light. Add in the vanilla extract and one third of the flour mixture, still beating on medium speed. Beat in half of the milk-egg mixture, then beat in half of the remaining dry ingredients until well incorporated. Add the rest of the milk and eggs, beating until the batter fully incorporated and smooth, then add the last of the dry ingredients. Once ingredients are thoroughly incorporated, give the batter a good 2-minute beating to ensure that it is thoroughly mixed and well aerated. Using a large scoop (about 3 tablespoons), distribute the batter between 20 muffin wells, filling each well 2/3 full. Bake for 18-22 minutes, or until a toothpick inserted into the centers come out clean. Cool on wire rack. In the bowl of a stand mixer fitted with the paddle attachment, beat the butter on medium-high speed for five minutes. With the mixer on low speed, slowly add in the powdered sugar, and continue beating until well blended. Add in vanilla and mix on low speed until incorporated. Turn the mixer back up to medium-high speed and beat the buttercream for an additional 5 minutes. If the buttercream is too thick, add in a bit of milk, one teaspoon at a time until you reach the desired consistency. Reserve 1/4 cup buttercream. Use remaining buttercream to pipe onto cooled cupcakes. Dip each cupcake into the shredded coconut to coat the frosting. Melt the vanilla candy melts according to package directions. Dip half of each mini marshmallow into the melted candy melts and then dip in coconut to create fluffy bunny tails. 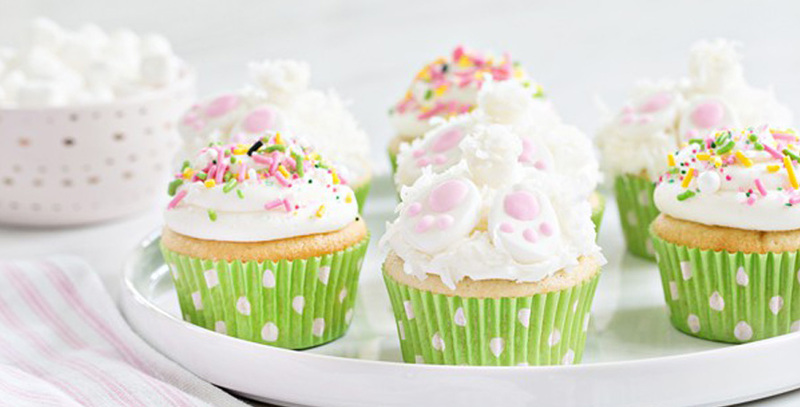 Use the reserved buttercream to adhere the bunny tails and bunny feet onto the coconut coated cupcakes.